Mersal Audio launch will be the one of grand events in the year and also it is the ever biggest event on recent times of release in Tamil Cinema. The makers have released two singles as early on two different dates and it is first time on Ilaya Thalapathy Vijay’s cinema career that his film’s songs were released in a complete album on early films. The first Mersal single released on August 10th on online music streaming web portals like Saavn, gaana, JioMusic, hungama, iTunes, Wynk Music, and others. Also, the second single of the film released on the internet like the same as first on August 17. Later, the Sony Music India released the official lyrics video of Mersal first single Aalaporan Tamizhan. The Video is nearing four million views after eight days of release on YouTube. It is expected that the Mersal second single Neethanae lyrics video will be released by the Sony Music India on August 18th Friday as they did to Aalaporan Tamizhan. 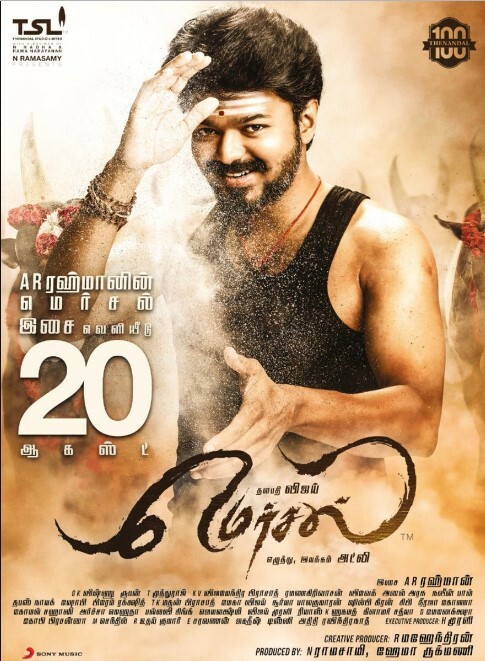 Sri Thenandal Films is the production company and who doing their work keenly to make Mersal Audio launch as grand on August 20. A new paper advertisement in Tamil and English confirmed it. This is the third film for Kajal Aggarwal with Vijay. Early these two actors were seen in a single frame on Thuppaki in 2012 and Jilla in 2014. Also, this is third film for Samantha with the lead Vijay. Kaththi is the first film for this love combination by AR Murugados in 2014 and Theri is the second by Atlee in 2016. Third film as a combo of Vijay and A R Rahman. Both of them have already did with Udhaya (2003) and Azhagiya Tamizh Magan (2007). Along with SJ Surya, Mersal is the third film for actor Vijay. SJ Surya directed a super hit film in 2000 by using Vijay as a male lead, it was Kushi. Then, he acted in a guest role on director Shankar’s Nanban in 2012. But, actor Vijay was not seen along with SJ Surya in a single frame. Mersal is the Sathyaraj’s third film with the young man Vijay. But, the actual count is four if we count the guest appearance of child actor Vijay in Naan Sigappu Manithan in 1985. Both of them were appeared on important roles of their early films of Nanban and Thalaiva in 2013. So, this is third film in a combo of Vijay -Sathyaraj. In general, Atlee’s third featured film is Mersal as a director. Though it is third film for Atlee with Vijay who early worked on Nanban as associate director, and Theri as a director.